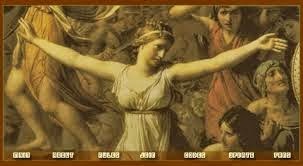 In the plays of Ancient Greece, the chorus helped to make transparent the motives and actions of the main characters on stage. Though undistinguished as individual actors, standing off to one side, the chorus offered comment and insight into the drama, helping the audience understand the tragedy unfolding and unpreventable. Indeed, while the chorus could sound lament, the message of its song was very clear: while you can know what is about to transpire, while you, like Cassandra, can call out the tragic future, you can change nothing. HB 2318 reinvents the Greek chorus. It offers a similarly ineffectual function—greater transparence without any meaningful hope that transparence can become translated into change. According to the bill, DCNR shall provide to the public a comment period, a public hearing, and access to relevant environmental review. But absolutely nothing in this bill requires DCNR to take heed of that public comment—even outcry—any more than the actors in a Greek Drama are expected to heed the chorus. The chorus does not sing its lament for the sake of warning or informing the actors; they don’t even hear the lament, much less change their course of action at its warning. Neither is the provision of the extended comment period or the greater transparency of HB 2318 intended to be taken as warning to DCNR in the hope of preventing that tragedy called slickwater horizontal hydraulic fracturing. No—the chorus exists only as a therapeutic device to placate the audience about a future they can do nothing to alter. HB 2318 similarly offers to allow the public to exhaust itself in comment, only to then be told to go on home by an agency—DCNR—that operates as a wholly owned subsidiary of the gas companies. Were I a gas company executive reading HB 2318, I’d be laughing. I’d be thinking about how profitable a thing it was for my company that the public could be duped into thinking that just because they got to speak that somehow their lament of the ecological destruction and the sickness and the community erosion would actually matter to my company’s plans to convert their public lands into a gas factory. I’d be amused at the prospect that this public could be suckered into believing that just because the permitting process might be slowed by their chorus of complaint, this would make a difference in the ultimate execution of my plan to drill. And compress. And pipeline. And export. And offshore the dividends. And then abandon the refuse. I’d say “Let them lament!” Because once they’ve had their say, they’ll go home, tell themselves they did everything they could, and go back to watching game shows and talent contests. HB 2318 is naught but a perversion of the democratic process. It pretends to offer us power—but it in fact strips us of our voices and leaves us like the Ancient Greek chorus—sounding an alarm all the while knowing there’s no one listening. It empowers the gas companies by pretending to regulate them—making their actions seem more transparent—all the while doing nothing whatsoever to forestall their appropriation of public lands. We are left like Cassandra—knowing what is about to befall us on our own lands, in our own forests, on our own waterways, but able to do nothing but lament. That is a perversity, and we are morally obligated to offer it nothing but contempt. Indeed, if we asked the question: how seriously does DCNR--the Department of Conservation and Natural Resources--take this bill? Answer: they didn't even show for the hearing. How's that for listening? 5(1) A public comment period. 6(2) At least one public hearing or meeting. 10and other related structures and facilities. 15aesthetic resources and public health. 16(ii) Discusses avoidance and mitigation measures. 19Section 2. This act shall take effect in 60 days. The Atlantic Sunrise Pipeline EIS: Demand FERC Do it Right! The following is a letter composed by Restoration Ecologist, Kevin Heatley and Philosophy of Ecology Professor/Writer, Wendy Lynne Lee. It's aim is to provide citizens potentially impacted by Williams Partners' (WPX) proposed construction of a 177 mi. 30-42 inch high pressure natural gas pipeline--the TRANSCO expansion, "Atlantic Sunrise"--with clearly drafted, precise information about the ecological hazards of this project. While this letter's focus is ecological, there are a number of other categories of serious hazard--property rights, the abuse of eminent domain, health hazards, and community division--just to name a few. This set is thus intended neither to be comprehensive nor definitive--but what we know is that if FERC took seriously any one of these DEMANDS, let alone the whole set, fulfilling it would become so expensive, onerous, and time-consuming that WPX would be compelled to abandon the pipeline expansion. Indeed, WPX (or any pipeline company) cannot fulfill these adequately because the harms just are beyond what they can assess, much less repair. We know that, and we know our readers know that. Hence, we invite you to copy this set of citizen DEMANDS for yourselves, your neighbors, include it in part or whole in your own comments to FERC, tack it up on doorways or trees, leave it at diners, bring it to read at the scoping hearings listed below. Send it to your legislators, your county commissioners--to whomever you think relevant to this project. Our aim is clear: STOP THE PIPELINE. The Federal Energy Regulatory Commission (FERC) has issued a Notice of Intent that it will be preparing an Environmental Impact Statement (EIS) for the proposed Atlantic Sunrise Expansion Project. This pipeline will entail approximately 177 miles of new 30 to 42 inch, high-pressure natural gas transmission line and will bisect at least 8 counties in Pennsylvania. As you are aware, the environmental and socio-economic impacts associated with this project pose a grave threat to the integrity and security of our region. This FERC Notice of Intent provides us with an early opportunity to register opposition to this ill-conceived and unnecessary expansion of natural gas infrastructure. As a citizen, you have a right to demand FERC develop a thorough and complete EIS. Unfortunately, our experience reviewing FERC EIS and (Environmental Assessment) EA documents associated with the last three interstate pipeline projects in our region (the Constitution, the MARC I, and the Tennessee Expansion) indicates that FERC has a history of producing inadequate and substandard analyses of impacts. We thus encourage you to utilize the following observations to inform your comments to FERC. Now is the time to insist that FERC fully account for all the social-economic and environmental consequences of yet another massive natural gas transmission line. This list is intended to demonstrate some of the inconsistencies in past FERC documents. Utilize it freely but we also encourage you to include issues of concern based upon your own personal insights and experience. · FERC has constantly refused to address the full cumulative consequences of expanding interstate transmission pipelines. A recent court decision has found this to be inadequate and unlawful. DEMAND that FERC fully account for the increased upstream drilling activity, and ultimate climate instability, that will result from expanding the natural gas transmission capacity! · FERC is required to develop an “alternatives analysis” that considers other options besides the construction of the proposed pipeline. 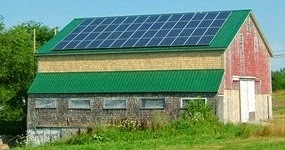 DEMAND an alternatives analysis that includes decentralized power generation (a model based upon private homeowner and community solar panels and wind turbines). · FERC has a history of ignoring the full impacts associated with fragmenting interior forest and creating new forest edge environments. DEMAND that FERC include 300 feet on each side of the pipeline as acreage impacted WHEREVER the pipeline crosses interior forest! · FERC has repeatedly allowed the pipeline companies to avoid paying for replanting of removed forest vegetation when “temporary workspaces” (often another 60 feet of right-of-way width) are cleared. DEMAND that FERC require a full restoration and replanting plan for EACH forest area “temporarily” denuded! · FERC often requires that agricultural soils be separated, stockpiled, and replaced during pipeline construction. However, they devalue and destroy forest soils, despite the inherent fragility of these resources. DEMAND that FERC require the pipeline company fully protect ALL soil systems. · FERC consistently fails to provide for adequate and comprehensive invasive species control. DEMAND that FERC require the same level of invasive suppression in both wetland and upland systems for the ENTIRE service life of the pipeline AND for newly created forest edge habitat adjacent to the maintained right-of-way! · FERC repeatedly allows open trenching of small and medium size streams during pipeline construction. Yet they require directional drilling under LARGE streams. This preferential treatment of watercourses is arbitrary and ultimately damaging to watershed health. The cumulative linear footage of water crossings involving smaller streams is potentially orders of magnitude greater than that associated with one or two larger water bodies. DEMAND that FERC require directional drilling during all stream crossings! · FERC allows pipeline companies to permanently maintain and mow a right-of-way width of 50 feet in upland systems. Yet they restrict the width to 10 foot in wetlands. There is no ecological rationale behind this arbitrary difference in right-of-way width. If a smaller right-of-way is possible for wetlands, it is possible for uplands. DEMAND that FERC respect the private property rights of upland land owners! FERC has a long history of advancing virtually every project seeking approval. Hence, it is unrealistic to expect FERC to deny the Atlantic Sunrise Expansion solely based upon community concerns or the comments of private citizens. If, however, citizens DEMAND that FERC develop a thorough and comprehensive EIS that addresses the full spectrum of socio-economic and environmental impacts associated with this pipeline, it will become apparent to both FERC and Williams Partners that this project is cost-prohibitive. In other words, if FERC took seriously its responsibility to assess the actual impacts of the proposed Atlantic Sunrise expansion, it would become clear that Williams' Partners' intent is to externalize the risks and the cost onto the taxpayers and communities who will bear the environmental, health, property value and divisive community impacts of this project--but enjoy few if any of the benefits. The only sound conclusion to draw is not that the pipeline can be moved, relocated, made more efficient. but that the pipeline should not and must not be built. 8.5.14: Lebanon Valley College, Arnold Sports Center, 101 North College Ave. In January 2014 the Commission declined to pass a resolution that would have waived the rules of the CMP and allowed South Jersey Gas to build the pipeline (click here to review South Jersey Gas Application pipeline page). The final vote was tied 7-7 and they needed 8 votes in favor for the project to move forward. But now the Commission is under a lot of pressure to overturn this decision. (Pinelands Commission Appointments - Pinelands Preservation Alliance). A lot of pressure. And how. In fact, although the purpose of the pipeline was ostensively to provide natural gas to the BL England Power Plant (Pine Barrens, New Jersey Pinelands Protection - Pinelands Preservation Alliance - South Jersey Gas Pipeline), I'd argue that this is only part of the story, and that the bigger play demonstrated by SJI's interest--and significant gamble--in the Marcellus Shale lay in its connection to LNG export. Fact is, South Jersey Industries just wouldn't be going to all this trouble to get in on the shale play if they weren't also planning to get in on the export bonanza. 1. South Jersey Industries is the "energy services holding company for utility and non-regulated businesses" (http://www.sjindustries.com/press-release/sji-enters-agreement-sell-certain-marcellus-shale-assets). South Jersey Energy Solutions, "the parent of SJI’s non-regulated businesses, provides innovative, environmentally friendly energy solutions that help customers control energy costs. South Jersey Energy acquires and markets natural gas and electricity for retail customers and offers energy-related services. MARINA ENERGY develops and operates energy projects including thermal facilities serving hot and chilled water for casinos, cogeneration facilities and landfill gas-to-electricity facilities." 2. "South Jersey Industries, Inc., through its subsidiaries, is engaged in the purchase, transmission, and sale of natural gas, as well as provision of other energy related services. The company sells natural gas and pipeline transportation capacity on a wholesale basis to various customers on the interstate pipeline system, as well as transports natural gas purchased directly from producers or suppliers to their customers. As of December 31, 2013, it had approximately 122.7 miles of mains in the transmission system and 6,247 miles of mains in the distribution system...as well as owns oil, gas, and mineral rights in the Marcellus Shale region of Pennsylvania. South Jersey Industries, Inc. was founded in 1910 and is headquartered in Folsom, New Jersey" (http://investing.businessweek.com/research/stocks/snapshot/snapshot.asp?ticker=SJI). 3. South Jersey Industries, the parent company of South Jersey Gas (created in 1948) created MARINA ENERGY in 2000 "to develop on-site energy production facilities that currently include thermal, combined heat and power, solar and landfill gas to electricity facilities" (http://www.sjindustries.com/about-sji/company-history). "In 2007, Marina Energy and long-time business partner, DCO Energy formed Energenic LLC to extend the success both companies had achieved with on-site energy production facilities. Most recently Energenic completed an energy facility for Revel Resort in Atlantic City and has a large energy project under construction at Montclair State University. Energenic also acquired The Energy Network, LLC, holding company for TEN Companies, Hartford Steam Company and CNE Power I, LLC in Connecticut during 2012" (http://www.sjindustries.com/about-sji/company-history). 4. December 8, 2008: POTATO CREEK: "SJI ANNOUNCES AGREEMENT TO DEVELOP MARCELLUS SHALE ACREAGE": "Folsom, NJ - South Jersey Industries (NYSE: SJI) today announced that Potato Creek, LLC has entered into a lease agreement with an experienced exploration and production company to develop the deep mineral rights on over 21,000 acres of property in the Marcellus Shale in western Pennsylvania. SJI’s wholly owned subsidiary, South Jersey Resources Group, LLC, is a minority partner in Potato Creek. In addition to receiving an upfront lease payment, Potato Creek has retained certain royalty and carried working interest rights that provide an opportunity to boost returns based on natural gas production on the property. The upfront lease payment will add an estimated 15 cents to SJI’s earnings per share over the life of the lease. “Currently we have a successful commodity marketing and shallow well program at Potato Creek in western Pennsylvania,” explained Edward Graham, SJI’s Chairman and CEO. “Leasing the deep mineral rights that we control to an experienced ... company enables us to begin realizing the value of this asset for our shareholders without incurring the risks and costs associated with drilling this acreage ourselves,” continued Graham." (http://www.sjindustries.com/press-release/sji-announces-agreement-develop-marcellus-shale-acreage). Interesting side note: These agreements appear to be directly connected to terry Engelder's predictions: "Penn State University geoscientist Terry Engelder said early in November that, based on several common industry assumptions, he estimates 363 trillion cubic feet of natural gas could be recovered over the next few decades from the 31-million-acre core area of the Marcellus region..."
5. ST. MARY LAND AND EXPLORATION COMPANY, NOW SM ENERGY COMPANY: "In December, 2008, Denver, Colorado-based St. Mary Land & Exploration Company (NYSE: SM) announced that it had entered into an agreement wherein it could earn 43,000 almost contiguous net acres (50,000 gross acres) of land prospective for Marcellus shale in the central Pennsylvania counties of McKean and Potter. In 2010, the name of the company was changed to SM Energy Company, and, as of August, 2010, it appeared to be planning either to sell its Marcellus shale and other non-core holdings or else enter into a joint venture. Bank of America Merrill Lynch had been retained to market the assets. By January, 2009 with a deteriorating economy, the company announced that it was cutting its Marcellus exploration and development budget by 54%. A May, 2009 report indicated that St. Mary planned to drill two horizontal Marcellus wells during the third quarter of 2009 and begin testing activities. It is permissible under its agreement to drill anytime before the end of 2010, so the work could be deferred until the following year. A further report at the end of June, 2009 qualified the above statement to say that that the company does plan to test part of its acreage during 2009." "One of St. Mary's business partners in the Marcellus venture already has gas gathering and processing capability that should give the company a leg up in marketing the gas. In November, 2009 St. Mary announced the drilling and completion of the Potato Creek 1H and the Potato Creek 3H, its first two horizontal wells located in McKean County, PA. St. Mary owned a 70% working interest (WI) in each well. The company was in the process of laying a temporary sales pipeline to the first of the two wells. The wells were expected to go online to sales in the second quarter of 2010. It further noted that St. Mary's acreage position in northeastern Pennsylvania's McKean and Potter counties amounted to 41,000 net acres. Update:In Augest, 2010 SM Energy (formerly St. Mary) announced that the Potato Creek 3H had begun producing to sales earlier in the month at a facility constrained initial rate of 7 Mmcfe/d.According to a February, 2010 news account, St. Mary's joint venture (JV) partner in the Potato Creek acreage was South Jersey Industries that owned the remaining 30% WI on 21,000 acres in McKean Co. The JV partners planned to drill two additional Marcellus shale wells during 2010. According to an early May, 2010, company update, St. Mary had decided to defer its 2010 Marcellus drilling program until June when its sales pipeline was to be complete. The company was required to drill two wells under its joint venture agreement during the year." "Tony Best is St. Mary's President and CEO" (http://waytogoto.com/wiki/index.php?title=SM_Energy_Company&printable=yes). best is set to retire in 2014 (http://www.ogfj.com/articles/2014/04/best-to-retire-as-sm-energy-ceo.html). So confident is Graham in the necessity of natural gas that he has taken Folsom-based SJI, the holding company of South Jersey Gas, into a different direction: drilling and production. And if the venture proves successful, the region’s largest public company stands to collect millions of dollars in revenue, analysts say, potentially “dwarfing” its other operations. In December 2008, SJI told investors that its subsidiary was spending $2 million for a minority interest in the mineral rights of 21,000 acres in western Pennsylvania. 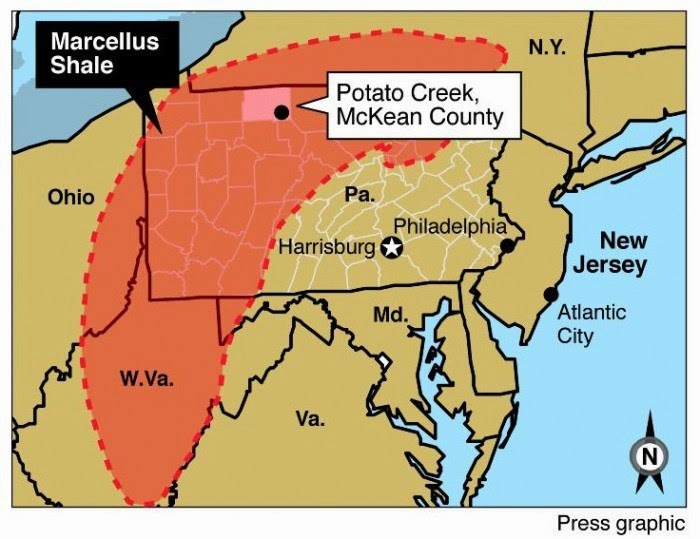 The area — known as Potato Creek — is part of the Marcellus Shale..." (http://www.pressofatlanticcity.com/business/article_194cf630-16b8-11df-affb-001cc4c03286.html). 7. July 18, 2011: "SJI ENTERS AGREEMENT TO SELL CERTAIN MARCELLUS SHALE ASSETS": Folsom, NJ - South Jersey Industries' (NYSE: SJI) announces that one of its subsidiaries has entered into agreements with Endeavour International Corporation (NYSE: END, LSE:ENDV) to sell certain Marcellus Shale assets for total cash proceeds of approximately $9 million. The transaction involves the company’s working interests and its interests in the gathering system held through its 30% ownership in Potato Creek, LLC. Since 2008, Potato Creek has leased the deep mineral rights on the 21,000 acres to SM Energy. Currently, three producing wells are located on this acreage and are included in the sale. SJI will retain its interest in the minerals and will continue to earn royalties on all gas production under the existing lease agreement. The closing is expected to occur in the fourth quarter of 2011. Edward J. Graham, chairman, president and CEO of SJI noted, “We are pleased to announce this agreement to monetize the non-royalty portion of our Potato Creek Marcellus assets. We remain very bullish on the Marcellus Shale as a source of abundant, low-cost natural gas that will serve as a foundation for this country’s future energy needs. This transaction will reposition our investment to focus on acquiring passive royalty interests throughout the Marcellus.” Graham continued, “SJI’s ongoing program to acquire royalty rights on natural gas production is a strategic fit with our position as one of the largest natural gas marketers in the Marcellus.” In addition to its Potato Creek royalty assets, SJI HAS ACQUIRED ROYALTY INTERESTS IN APPROXIMATELY 2000 ADDITIONAL ACRES THROUGHOUT THE MARCELLUS." (my emphasis). http://www.sjindustries.com/press-release/sji-enters-agreement-sell-certain-marcellus-shale-assets. 8. December 18th, 2013: "South Jersey Industries : SJG to Provide $12 Million Bill Credit to Customers": "FOLSOM - South Jersey Gas has notified the New Jersey Board of Public Utilities that it will provide a bill credit of approximately $12 million to its customers..."With the availability and close proximity of Marcellus Shale gas to our service area, natural gas prices continue to remain low, which provides us with the ability to offer this bill credit. We're very pleased that we are able to provide our customers a reduced bill during a colder month when heating costs tend to be higher due to increased usage," said Jeffrey E. DuBois, president of South Jersey Gas" (http://www.google.com/search?client=safari&rls=en&q=Edward+J.+Graham,+Williams+Partners&ie=UTF-8&oe=UTF-8). 9. May 14th, 2014: "South Jersey Industries executives confident of pipeline approval": "Executives with South Jersey Industries, the parent company of South Jersey Gas, said in a conference call with investors last week that they are confident that a 22-mile natural gas pipeline from Millville to the BL England power plant in Beesleys Point will ultimately become a reality...“We are incredibly optimistic about the outcome and, in fact, I think it's realistic in our minds that to think that we're going to start to spend money on this project of this magnitude during 2015,” Graham said according to a transcript on the website SeekingAlpha. “…I would very much hope before 2016 ends that would be in service.” (http://www.shorenewstoday.com/snt/news/index.php/upper-township/upper-township/52372-south-jersey-industries-executives-confident-of-pipeline-approval.html). 10. SOUTH JERSEY INDUSTRIES CONNECTION TO WILLIAMS AND THE TRANSCO, AND TO DOMINION: "South Jersey Gas Company, operates as a regulated natural gas utility. SJG distributes natural gas in the seven southernmost counties of New Jersey. It has direct connections to the interstate natural gas pipeline systems of both Transcontinental Gas Pipe Line Company, LLC (Transco) and Columbia Gas Transmission, LLC (Columbia)...SJG also secures other long term services from one additional pipeline upstream of the Transco and Columbia systems. This upstream pipeline is owned by Dominion Transmission, Inc. (Dominion). Services provided by Dominion are utilized to deliver gas into either the Transco or Columbia systems for ultimate delivery to SJG. Services provided by all of the pipelines are subject to the jurisdiction of the Federal Energy Regulatory Commission (FERC). Transco Transco is SJG's major supplier of long-term gas transmission services which includes both year-round and seasonal firm transportation (FT) service arrangements..." (http://investing.businessweek.com/research/stocks/snapshot/snapshot_article.asp?ticker=SJI). "Williams Partners L.P. (NYSE: WPZ) today announced that its Transco pipeline system received binding commitments from shippers for 100 percent of the 448,000 dekatherms of firm transportation capacity under its Dalton Expansion Project, which would support providing access to Marcellus shale gas supplies to customers in northwest Georgia for incremental electricity generation and growing local distribution load. Additionally, AGL Resources (NYSE: GAS) has entered into agreements with Williams Partners to jointly fund the Georgia lateral portion of the expansion. "The Dalton Expansion Project is one of six large-volume projects Transco is pursuing to connect approximately 3.4 million dekatherms of natural gas from surging supplies in the northeast to high-value growth markets in the southeast," said Rory Miller, senior vice president of Williams Partners' Atlantic-Gulf operating area. "By year-end 2017, we expect to add more than 50 percent to Transco's system capacity with mainline expansions that include the Dalton Expansion Project, Atlantic Sunrise, Leidy Southeast, Virginia Southside and others to meet the increasing demand for natural gas in the region."" Williams (WPZ) is an MLP and operates the TRANSCO. This is the company responsible for the proposes Atlantic Sunrise Expansion that will bisect a number of Pennsylvania Counties. This is just the tip of this iceberg, and no doubt domestic markets are one target of this company. But what's also clear is that Mr. Graham is taking a gamble by expanding his company interests well beyond its traditional reach--and into the Marcellus Shale on the same promise of "strike it rich!" that Terry Engelder made possible. The only way to make that promise pan out for his shareholders is to expand beyond the domestic markets because while good advertising can make these markets more profitable, the pressure to realize those dollars is very very real given that, as we can already see in the Baaken, the Eagle Ford, and other shale plays, the gas will decline in production, and it will do it quickly. Hence, Graham must acgt and act aggressively before this boom goes bust. And the Pine barrens, just like the Everglades in Florida, Tiadaghton and Loyalsock State Forests in Pennsylvania, Mount Rushmore, tribal lands across the country, and so many other places large and small, known and unknown (like you yard) hang in the balance.